Will registration is one of those important aspects in Will-creating procedure which also offers the benefit of being the simplest too. It is also no longer limited to rich families as it is a widely used document part and parcel of every family. You can’t necessarily escape death or a will! One of the factors which brings relief to any family after a grief stricken blow as death is to not have any sort of disagreements with the division of properties among the family members. In this article, we answer you all the queries surrounding the registration of a will, apart from which you will also be glad to know that we also engage in online Will-creating services which are drafted by our in-house legal experts. We also ensure everything from the drafting of clauses to the delivery of wills to your doorstep. We already help make and deliver Legal documents in 12 states, and for the rest we let you download the soft copy of your wills, which you can print and execute at the comforts of your home! How To Register A Will? If your Will is drafted and ready to be printed it is only a personal wish which will carry it forward in the direction of registration. Indian Succession Act, 1925, does not mandate the registration of a Will and it boils down to the personal choice of the Testator. To register your will, go to the nearest Sub-registrar office where the Testator of the Will resides. Apart from your address proof, the witnesses who are to sign/provide a thumb impression are also to carry their photographs and address proofs. The law doesn’t mandate will registration, but here is why we think you should. However easy it may be to execute, Will is a tricky business. There may arise circumstances where due to lack of trust among our own relatives we may have to name an Executor, not to mention the necessities of naming a Power of Attorney, if we are sick. All these reasons make it imperative for you to create your Will when hale and hearty. These circumstances not only make it necessary to execute a Will but to register as well. Through registration, your Will is safeguarded as it will be in the public domain, and no attempts of trampling can destroy its contents. Will registration, really, is the most you can do as a way of transferring properties to minors. Since a minor cannot acquire a property as his/her own, you will have a to name a guardian who until such a time arises where he can acquire one, the property will be titled under the guardian after which it has to be transferred to the minor. Clauses of this kind can be explicitly stated in the will. In legal terms, registration is the best way to ensure the safety and security of your documents which is why will registration becomes necessary in the circumstances where vulnerabilities in the form of old and infirm, widows and minors exist. What Happens After Will Registration? After registration of a Will, the original copy of the registered Will will be with Sub-registrar Office while you get to keep a copy of it. If you want to modify any clauses in your Will, it can conveniently be done so through a Codicil, which is also a document enlisting the amended clauses of the Will. It is then attested by the Testator in the presence of two witnesses and kept along with the Will in the Registrar office. The Codicil doesn’t require registration but rather just the signatures of the Testator and the witnesses for it to take effect. A ‘Probate’ is a copy of the Will attested by a competent court of law which controls the jurisdiction of the Testator’s residence. Probate can also be called as ‘letters of administration’ as without which, i.e., an explicit permission from a competent State court, a Will cannot be executed by an Executor. If you have named an Executor, and doubt the adherence of the stated clauses in the will, one can get the original Will probated from a court of law. A registered/unregistered Will can be probated by a nominee or executor of the Will through a lawyer. For further queries regarding the probate of a Will, you can contact LegalDesk.com for details. Also, it is important to remember that Probate cannot be acquired when the Testator lives as one of the necessary documents for the same is a proof of death of the Testator. In the cities, Mumbai, Kolkata and Chennai, acquiring the Probate of a Will is mandatory for executing immovable properties of a Will. How To Create A Will With LegalDesk.com? If you haven’t created your Will yet, there is no better time to do so. 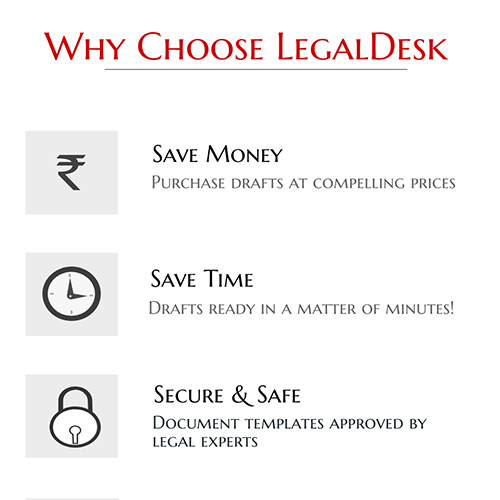 With LegalDesk.com, you can start creating a will right now by clicking the button below. Use the customizable, lawyer-drafted Will templates available on our website, make the stipulated online payment and download your copy now. Since a Will doesn’t require for you to pay Stamp Duty charges, you can download and sign the document at the comforts of your home. As opposed to the traditional way of creating Wills, this is much easier and in-sync with the times we live. And besides providing you a ready to use will, we also help you with the will registration service. Before proceeding to register, do have a look at our other services as Will is not the only legal document we help you create online. There are 3 comments on "Do You Know The Procedure For Will Registration?". After getting Probate of Will from High Court, is it possible to get property registered at Sub-registrar’s office even if Partition Suit for same property is pending at City Civil Court? should the witnesses on the codicil be same as witnesses on the original WILL to which the new document is a Codicil?